Wetted Materials: See pressure chamber and diaphragm material in model chart. Enclosure Rating: See ratings chart. Switch Type: SPDT or DPDT snap switch. 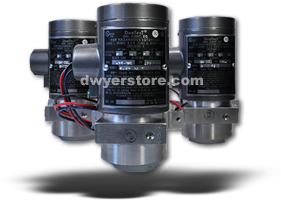 Electrical Rating: 5A @ 125/250 VAC, 30 VDC. Electrical Connections: see model chart. Weight: 4 lb, 2 oz (2 kg). Deadband: Approximately 5% of range. Agency Approvals: UL and CSA see ratings chart. CE. ATEX pending. Example H3 S 2 S C MV H3S-2SC-MV Differential Pressure Control; 316SS pressure chamber and Viton® diaphragm, weatherproof and explosion-proof enclosure, SPDT snap action switch with gold contacts; fixed deadband; automatic reset; adjustable range 0.5-15 psid.